Description: Very popular for hundreds of years in Europe and the Mediterranean, leeks are recently growing in popularity in America. 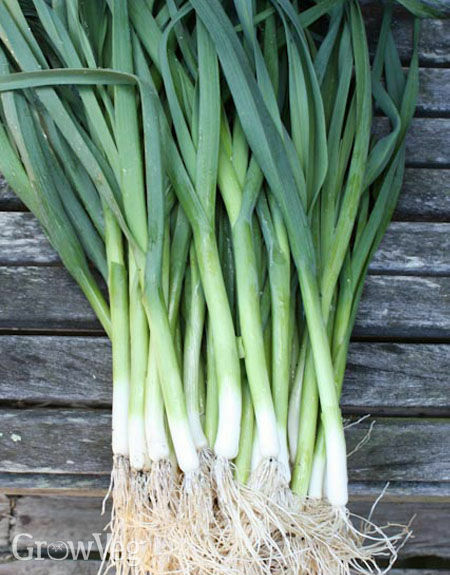 A close relative to onions and garlic, the leak has a more subtle and sweet taste than the onion and can be eaten raw, boiled or fried. Commonly used in soups, the edible part of the leak is the bundle of leaf sheaths sometimes referred to impromperly as the stem or stalk.. Kitchen Pharmacy: Leeks are believed to support good cardiovascular health as well as help prevent atherosclerosis, type 2 diabetes, obesity and rheumatoid arthritis.